Bosch has launched a new pilot fermenter to cultivate active pharmaceutical ingredients (APIs) on laboratory and pilot scale. Bosch has designed the new pilot fermenter to meet the specific requirements for the production of APIs, and to be suited for a diverse range of applications. The fermenter can process batch sizes from eight or 13 liters to 50 liters, based on the selected mixer. Additionally, the company is providing reactor sizes for 100 and 200 liters for pilot and small industrial batches. The system can be installed with one of several interchangeable mixing elements depending on requirements, enabling to be used for different cell types and process controls. The mixer is said to regulate the inflow of liquids or gases required for cell cultivation. Sensitive cells need the use of gentler technologies such as air lift module, while more robust cells can be stirred mechanically. Bosch has also developed a separate module that provides high-precision dosing for liquid media with four syringe pumps. The system can also be extended to include additional peristaltic pumps, helping to dose additional process fluids. It also supports batch and fed-batch processes, and perfusion and continuous processing, as the pilot fermenter is installed with a gentle rotary pump and a second reactor vessel. Bosch subsidiary Pharmatec, sales director Dr John Medina said: “In the pharmaceutical industry, the manufacture of complex compounds using biotechnological methods continues to grow in importance. 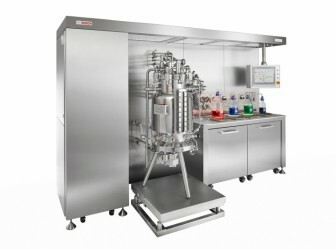 Image: Pilot fermenter for manufacturing biopharmaceutical APIs. Photo: courtesy of Robert Bosch GmbH.